HE LIFEBLOOD of our work as sacred musicians are the Church documents such as Constitution on the Sacred Liturgy (1963) and Musicam sacram (1967). However, realities in parish life often find resistance to those documents, which leads us to relying upon the guidelines handed to us by the bishops. 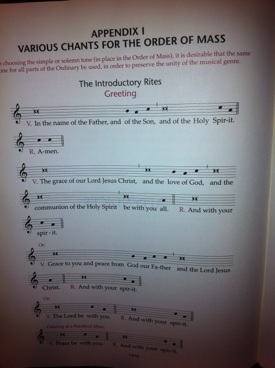 I have often made reference to the 2007 US Bishops’ document Sing to the Lord: Music in Divine Worship (SttL) Fortunately, SttL frequently points back to the GIRM and the Vatican II Documents. If the Vatican II documents are ignored, let’s look at the bishops’ guidelines. So, after nearly six years, where do we stand in our parishes? As imperfect as it is, often ambiguous and arguably self-contradictory, SttL still has worth as a teaching tool in certain areas. So, how much of this document have we implemented on the parish level? Some parts of SttL are worth a look, as they serve as reminders and include many surprises for some congregations. In coming weeks, I will be taking a closer look at certain sections of SttL. One of the most important sections worth a review (and full of surprises for most parishes) is the “hierarchy” of importance in what parts of the mass should be sung. Let the surprises begin! These are of the highest priority. Most profoundly, the singing of the priest celebrant gives proper liturgical perspective to the singing roles of the congregation and choir. The second most important is quite interesting with tremendous implications most often overlooked in most parishes. It places great emphasis on the singing of the psalms—not just the Responsorial Psalm, but the psalm verses along with the antiphons as part of the Entrance and Communion Chants. What SttL does not say explicitly, it implies rather directly—that this document gives very high priority to the singing of the propers! That hymns are of the lowest priority may come to many as something of a bombshell—no less a surprise! I hope in the end that the greater “surprise” will be in how our prayer is formed by what we sing. I hope this will be the most pleasant surprise of all.